It takes a brave soul to wear white boots. It's sort of like wearing your best dress clothes while painting a wall, or eating saucy chicken wings in your brand new car. At a certain point, you're not just tempting fate to make a huge mess; you're practically giving it the bird. So, why would wearing bright, clean white boots on your feet, which are habitually as close to the filthy ground as any part of your body gets, a good idea? The short answer is because these Adult White Costume Boots look awesome! 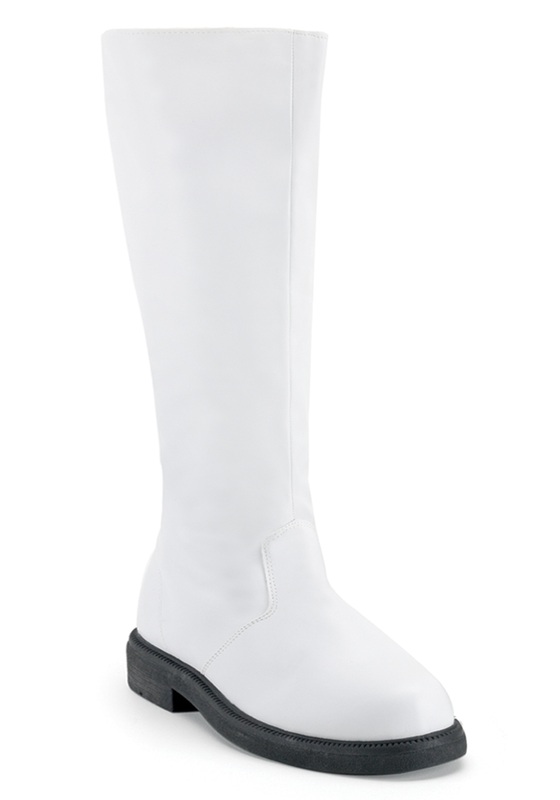 The long answer is because these high quality faux leather boots can be an impressive feature of your outfit, whether you're dressed as a sci fi space trooper or a superhero who wears brilliant white boots! They also provide comfortable style at a much lower cost than similar looking name brand footwear. So, you can focus more on how awesome your costume looks, rather than on not scuffing some flashy overly expensive boots!